Much was made about Stan Van Gundy's 4-out, 1-in offensive scheme prior to the season, what with Andre Drummond passing as a young Dwight Howard and the Pistons' influx of shooting in free agency. But simply posting up Drummond every time down the floor is unsustainable, and generating good outside looks requires off-ball movement and a team passing quickly around the floor. Play design dictates this movement, which was woefully lacking last year (hence the 19.3 3FGA/game in the '13-'14 season). In the first half of yesterday's game, the Pistons ran an unusual offensive set that takes advantage of many of the en vogue trends in NBA offenses today. 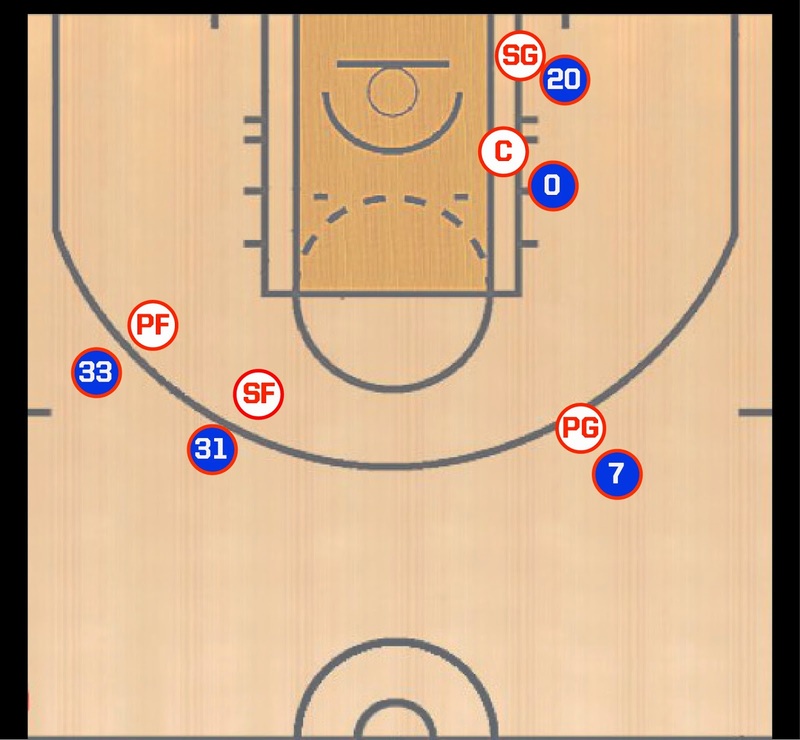 With Brandon Jennings bringing the ball up the right side of the floor, the most obvious (and unusual) formation on the floor was Caron Butler and Jonas Jerebko standing next to one another on the left wing. In addition, Jodie Meeks is standing on the baseline behind Drummond, who is in the post. When Jennings gets to the right wing, Drummond sets a pin down screen on the block, allowing Meeks to curl out from the baseline and flash through the lane. This is Jennings' first read. If Meeks gets open in the lane, Jennings can quickly pass him the ball for a layup. (Meeks also has the option to drop a pocket pass to Drummond who would roll to the basket if Jennings throws the ball inside, but that never happened in this game.) If Meeks doesn't get open, he runs directly to the opposite short corner. 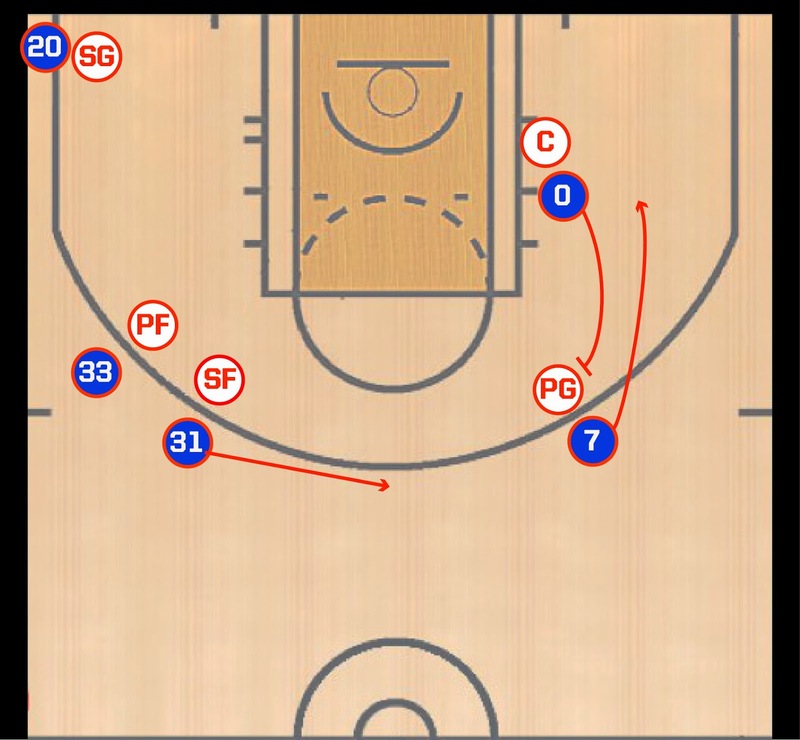 With Meeks in the opposite corner, Drummond now rolls up to the right wing to play a two-man game with Jennings. Drummond sets a pick freeing Jennings to attack the outside of the formation. 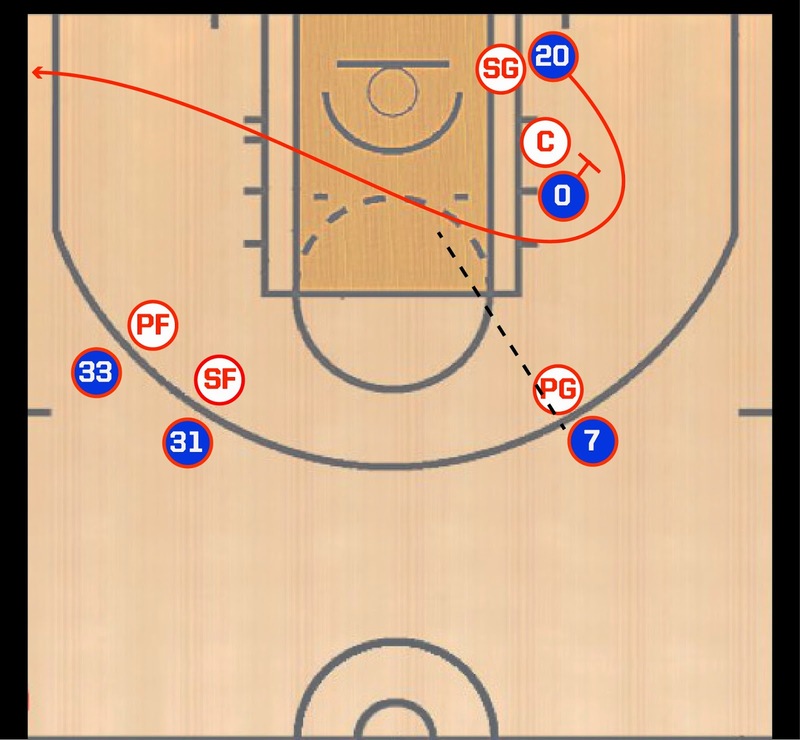 In addition, Butler moves from his spot on the wing to the top of the key, giving the Pistons three-point shooters spaced evenly around the weakside of the court. As Jennings turns the corner of the Drummond screen, he has five potential options. Other than taking a shot or attacking the rim, Jennings has a clear view of the court and can potentially see all four of his teammates. If Jennings can put the defending point guard on his hip, that forces the center to defend Jennings, opening a dive for Drummond (hence all of the alley oops in the first game). If the opposing shooting guard, power forward, or small forward collapse on Drummond, Jennings will have an open three point shooter. Commence swinging the ball around the perimeter to generate an open three pointer. This play is little more than a high pick and roll between Jennings and Drummond, but it's the off-ball movement and eventual spacing that make it such an effective set. One of the problems with the Pistons offense last year was the lack of options. 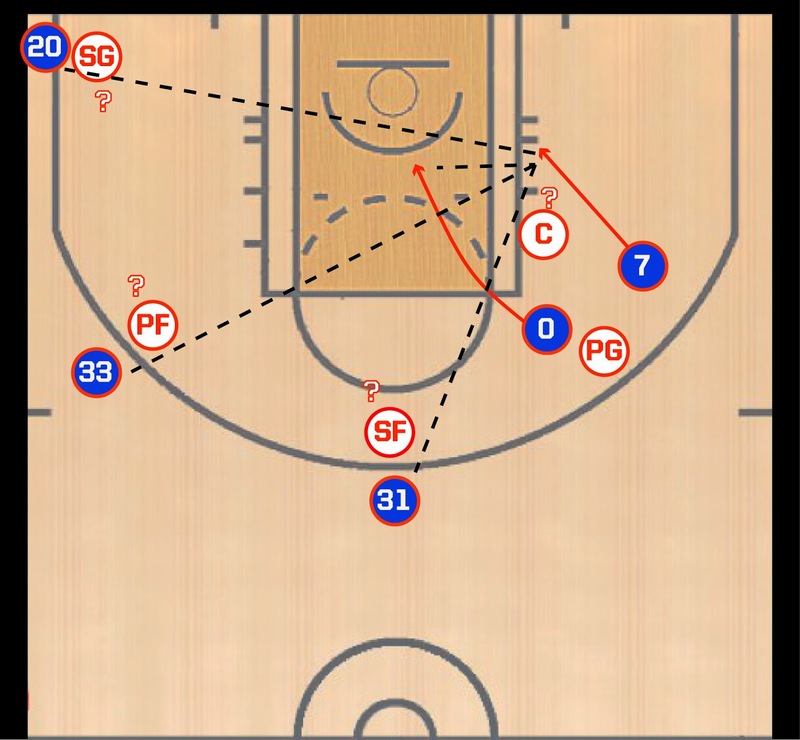 Often, the team would run a similar pick and roll from the wing but would have a shooter in the playside corner or Monroe/Smith on the weakside block, constricting floorspace for Jennings or Drummond, respectively. With this alignment, if the first few reads aren't available, it's because the defense is helping off of a shooter, leaving him open for a three pointer. This play has some restrictions. The Pistons can only reliably run it with Jerebko at power forward because of the necessity to have a stretch-4 to put pressure on the defense. A Drummond/Monroe frontcourt could not run this set, and putting Josh Smith out as one of the floor spacers is begging for a missed jumper. However, given the space on the inside, even a Smith brick could end up as an easy Drummond putback.